“Is your cell phone physically harming you each time it rings? Is your microwave cooking more than your leftovers? “The science has been around for about 30 years. It started in Europe,” she said, noting that it is commonly used in South America, the Far East, and Canada but is almost unheard of in this country. "As Dr. McClain started explaining it to me, I began to grasp the concept. Then she demonstrated her BioScan machine on me. The results were stunning; they freaked me out! Without knowing anything about me or my medical conditions, she accurately detected every single problem I was having and even found some I didn’t know about." Dr. Ferryl featured in the Fort Bend Star. "McClain was introduced to bioenergetics 32 years ago when she developed panic attacks during a pregnancy while living in Tennessee. 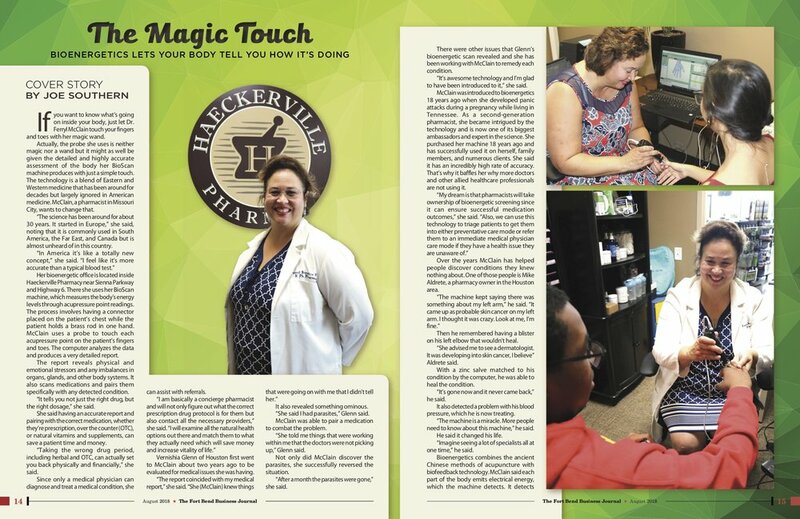 As a second-generation pharmacist, she became intrigued by the technology and is now one of its biggest ambassadors. "